Uncommon, the company that makes customizable cases for your iPhone, iPad, iPod or MacBook, has some of my patterns in their image collection. You can pick your favorite design and apply it to the case of your choice. Then Uncommon will make it for you and mail it to you in a flash. Now they've added a customizable iPhone 5/5s Power Gallery™ case to their lineup— a case you can switch on to charge your phone while you're carrying it around in your purse. And they're giving away one case with any Jessica Jones artwork! It's a $119.95 value; not too shabby. Check out your six pattern choices here. To win a case, enter the giveaway by Thursday at midnight EST using the Rafflecopter widget below (it might take a second to load below this paragraph— wait for it!) A winner will be selected using random.org, emailed, and announced in this post on Friday. International entries are welcome. Update: The winner is Hanna, who lives-- get this-- "just outside Oslo." Outside Oslo is the name of my last fabric collection, so clearly it was meant to be! my favorite it the washi! Love the washi design! Happy colors. Calliope is definitely my favorite! Love that blue background! Love the Fireworks design and I love your blog!! Love them all, but I'm leaning toward Fireworks as a fave! Hard to make a choice, but Wildflower is the ultimate chosen one! I love them all but Wildflower is definitely my favorite! These are awesome! I'd love to win one. Thanks for hosting the giveaway! I've always loved fireworks! Pink and orange is my fave color combo! Fireworks is my favorite! Thanks for the chance! I never get tired of Calliope. I used the fabric to make bins and recover a chair for my sewing studio... it'd be so fun to have it on my iPhone, too! I like calliope. Reminds me of fried eggs. my fave is the suns one! Fried eggs. I love fried eggs. I can't decide between calliope and wildflower as my favorites! I love the Wildflower!! Just love that one the best!! Great giveway! I love the wildflower pattern. Love the cobalt blue one. I would love the wildflower pattern! Thanks for the awesome giveaway! The Emerald Black one is gorgeous. Calliope is my fave... bit Fireworks is a close second! Forest. Makes me think of long walks and picnics with coffee and cinnamon rolls. i love all the patterns, but i especially love wildflower! It's hard to choose a favorite pattern, because I love them all! :-) I think that Wildflower might be the one that drew my eye first, though. these look amazing with your artwork! i don't know if i could pick a favourite... would probably have to be wildflower! The washi pattern is gorgeous. Love the colors. I am crushing on washi HARD! Too hard to choose! I think Wildflower is my fave. I love them all, but I think Forest is my fave! I love them all, but I think I would choose washi as my favourite. Forest is definitely my favorite, but my mom would love to use Garden. Gotta go with Calliope! Love them all though! I was searching for an iPhone case the other day and came across these! Cool! I think Fireworks is my favorite, but they are all so happy and playful! It was a difficult choice… but Washi is the winner! So tough to choose! I'd have to go with Calliope - simple yet colorful. Love the wildflower. I just joined the smart phone population and would be psyched to protect my phone with such fashion. They are all very pretty, but I'd go with either Forest or Wildflower, since I'm partial to green and blue. It's all about your fireworks! I love that the case would match my outfit every day. I love pink! It's really hard to pick a favorite, but I'll go with Washi. I also really like Fireworks and, well, all of them. So cool! I love the tree/forest design! Forest is definitely my favorite! I like the Garden print! Oh the calliope is amazing! Calliope is so cute! These would be a lifesaver! It's SO HARD to choose, but I think Garden is my favorite. Or Calliope. Or Fireworks! Ugh, I might need them all! Not sure which is my favorite. It will be difficult to choose. I love the Washi pattern! Calliope or washi? Washi or calliope? Thanks for the giveaway! I'd love to have extra battery AND my phone is naked. Win win! I love the washi!!! Great job! toss up between wild flower and washi, love the colors of both! Oh, it's got to be Washi. I like the forest theme - such cute little trees! Fireworks is a fun one. I am totally digging the washi print. So hard to choose between calliope, washi and fireworks but I think (for now anyway!) that WASHI just pips it. How clever. Calliope is my fave. I love the Calliope. The Washi is a close second. I love the fireworks! But they're all awesome. such a tough choice, but I think my favorite is the washi! Torn between forest, wildflower and fireworks, but I think I'd pick wildflower. Maybe forest. Or fireworks. I can't decide! Fireworks is the design choice for me! Thanks for introducing me to this line! Fireworks and wildflower are my fave! How cool to have your prints in this. Awesome and congrats! 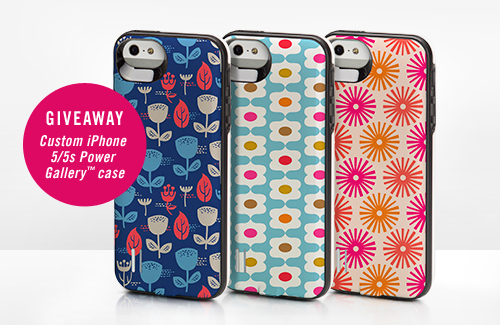 Tough to choose between Wildflower and Fireworks...and Washi. The color combo on Fireworks is one of my favorites though. My favorite pattern is Washi! Washi is my favorite, but Calliope makes me pretty happy. I love Uncommon and I REALLY love how about orange. Like cookies and milk! I love the fireworks and the wildflowers both! Love the washi design! So cute. I love the garden pattern! I love your designs! I used your Outside Oslo Wildflowers, Tulips, and Dusk Skiff to sew an awesome iPad case. It makes me smile every time I see it! I, or rather my son, likes the Wildflower one! But they all great. Oohh! I love Wildflower and the Forest design too! Ahh they're all so amazing! I think my absolute favorite would be Washi. It reminds me of a mermaid tail. Ooh, I love Wildflower and Fireworks (and all of them, really)! My favorite pattern is Fireworks! Hands down, Washi. They are all gorgeous. It's hard to choose just one to be favourite but I am super in love with the washi design. Oh my goodness, I want one so badly! I love your flowers (wouldn't they make a fabulous tattoo?) so I think it would have to be Wildflower. I'm tossing up between Forest or Calliope! I love Fireworks. What a great giveaway! I can't choose between forest and fireworks! omg, a washi case would be AMAZING!! Forest is the one...I love the tress! Probably wildflower. Washi is a close second, though. Oh man, it's so hard to choose! I think I have to go with Forest. I hope I win!! I can't decide between Fireworks and Wildflower. Love them both! I'm a fan of Fireworks. Calliope. I have that fabric and love it! I love the trees. My current cell phone case is uber pathetic!!!!!! omgosh all of them! calliope and wildflower! These are fantastic! It is a tough call because I like them all but I think I would have to choose wildflower.